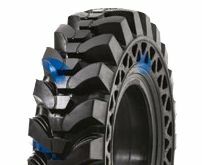 An extreme-duty solid telehandler tyre. With optimized stability, durability and comfort, it delivers flat-free operation and traction in extreme applications. CAMSO TLH 792S SolidAir design is a highly engineered and in field tested tyre that provides the ultimate in puncture proof performance.